We are continuing on from the weapons used in the times of The Ramayana. Brahmastra has been mentioned quite frequently in ancient texts and Mahabharat is no exception here. As described in the sastra, a Brahmastra is an astra. This is created by Lord Brahma. It is sometimes known as the Brahma Astra (astra referring to ‘missile weapon’). As described in a number of the Puranas, Brahmastra is considered to be the very deadliest of weapons. When a Brahmastra is discharged, neither a counterattack nor a defense of any kind can stop it. This weapon can only be neutralized by Brahmadanda (stick of Brahma). Karna has the knowledge of this potent astra. Though he was not able to use this because of the curse of Parshurama. Vishwamitra used this against Vasistha. Vasistha neutralized this weapon and defeated Vishwamitra. The whole story is narrated here. There was another powerful weapon called Brahmashira. Brahmashira was never used in war. It had four times more power than the Brahmastra, i.e fourth power square. This was because Brahma has four heads, thus the name. Only Arjuna and Ashwatthama possessed the knowledge to summon the Brahmashira. Arjuna has the knowledge to retract this, but Ashwatthama did not. After Ashwatthama killed uppandavas, a fight ensued between him and Arjuna. During the fight, Ashwatthama invoked the extremely powerful Brahmashira, against Arjuna. Arjuna in response invoked the same astra. Fearing the destruction of the world, the sages advised both to take back their weapons. While Arjuna could do so, Ashwatthama (presumably having less skill) could not, and was given the option of choosing any single target to destroy. Out of spite, Ashwatthama directed the weapon to the wombs of Pandava women. Among them was Uttara, Arjuna’s daughter-in-law. 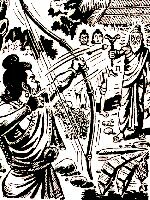 Shri Krishna saved the unborn Parikshit, but cursed Ashwatthama for his cowardly act. I always read ur articles they r very knowledgeable….thank u very very much.